St. Cloud Estates is a large motor home/RV friendly property that was purchased and designed to provide the opportunity for RV lovers to have a beautiful home (seasonal or permanent) that is a great base for their travels. We are long-time motorhome owners and travelers that were looking for that perfect spot to call home, and be able to share the same opportunity with our friends. The property is 110 acres on top of rolling hills with 360 degree views of the Appalachian mountains. We purchased this property with the sole intent of developing it to be THE perfect RV-motorhome owner designed property. The property is located very conveniently near Interstate 77 and US Highway 58 (which runs east-west). Being so close to the major highways, this makes the property an excellent location to serve as "base camp" for your Motorhome. The property consists of 110 acres of land divided into 45 very large lots. 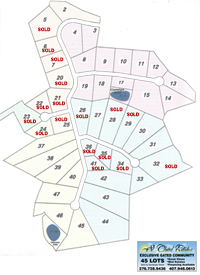 The acreage per lot ranges from 1.5 to 5 acre lots. Multiple adjoining lots are still available at this time. The entrance to St. Cloud Estates is gated and is located directly on US 58. The roads throughout the property are newly constructed, paved and are 18 feet wide to accommodate the largest RVs. Every site has been completed and all utilities are ready for use. The electric has been oversized in anticipation of motorhome requirements for the largest RVs. No expense was spared in developing the property and keeping it in its natural state.